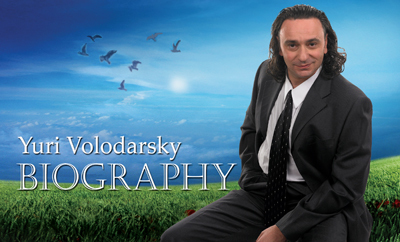 Yuri Volodarsky is quite the Renaissance man. He’s best known as an actor, writer, and a director and producer of film, television, and video. But he’s also an exceptionally talented musician, as both a composer and a performer. Yuri has been involved in quite a few musical projects, dating back to his earliest compositions created in the mid to late 1970’s, and continuing until now. Along the way, Yuri has created several long form progressive rock compositions, numerous songs, soundtracks for movies and television series, music videos and also some truly wonderful and unique jazz compositions. He began playing piano at the age of four and, early on, Regina Volodarsky (his mother, a professor at the Stoliarsky School in Odessa, Ukraine) and Ilya Volodarsky (his father, an opera singer) were strong, steadfast, and enthusiastic, influences. He honed his technique and musical chops both at home and over an eight year run at music school. He joined his first rock group, Hungry Bones, in 1973 and the band had its debut performance that same year. However, he was not happy with a style and direction of the group, and in 1974, Yuri left Hungry Bones, and started composing his own music and playing his own songs and solo compositions at various local venues. Inspired by the classical masterpieces of Borodin, Rimsky-Korsakov and Tchaikovsky as well as by the performances of leading progressive rock bands and artists Emerson, Lake & Palmer, Rick Wakeman, Triumvirate and Pink Floyd, Yuri formed a new progressive-rock group, Experiment, in 1979, featuring Yuri on keyboards, Michael Shuster on bass and Alex Royz on drums. The trio performed Yuri’s first long form instrumental composition “Kingdom of Fun Mirrors.” That was a huge accomplishment at the time for a local USSR band to perform progressive rock using a combination of live performance blended with several pre-recorded tracks. In 1981, Yuri Volodarsky decided to re-arrange “Kingdom” for a quintet and he invited for each performance various saxophone and guitar players as well as the young talented drummer Igor Semionov. Yuri and Experiment debuted another progressive and even riskier musical project called “Lyrics about a Soviet Passport” in 1983. He composed the music in a progressive and jazz-rock style taking the lyrics from Vladimir Mayakovsky, the famous poet of the Soviet Revolution. The political controversy this created nearly got him expelled from Odessa’s Polytechnic School where he was finishing up work on his degree in mechanical engineering. The year 1983 proved to be quite a busy one for Yuri and his colleagues and collaborators. He and Igor Arbatov (the well-known saxophone player) got together for the first time as musicians even though they’d performed separately, and in similar circles, for years. They composed music for a two act theatrical play “White, Black, Spotty,” which premiered at the International Festival of Youth and Students in Moscow and was performed by the clown troupe Maski. Also, 1983 saw Yuri and Igor compose the music for Maski’s Annual New Year’s Play. Experiment’s final performance took place in 1985. Yuri composed an instrumental, progressive rock, long form composition devoted to the 40th Anniversary of the End of The Second World War. 1988 was another very successful year for Yuri Volodarsky. He produced the music video “Odessa-Mama” which debuted to great success and acclaim at The Golden Duke International Movie Festival and also participated in several other international festivals including The Funny Films Festival in Boario Terme, Italy, where Yuri received another Festival Award. “Odessa-Mama” was also broadcast numerous times on Gosteleradio (National Television), USSR. Starting in 1990, Yuri composed a number of pieces for television specials and series, including “Maski Looking For Treasure,” “Best of the Best,” “Merry Family,” and “Bachelors,” among others. His work as a producer and director in television and film kept him quite busy throughout the 1990’s and 2000’s but he never stopped composing, and his love of music never diminished. In 2012, two musical producers, Eugene Sharikov and Valery Alborov, approached Yuri with an exciting proposal: to create and release two CDs of his compositions featuring new material as well as compiling the best tracks from his long and storied career. The first CD, “Revelation” would consist of Yuri’s smooth jazz and fusion compositions while the second CD, “Without A Word,” would feature Yuri’s soundtracks, symphonic and symphonic-jazz-rock pieces. Work on the two CDs took over three years to compose, record, arrange, re- record, mix and master in Los Angeles, New York, Monterey, and Moscow with a dream team of internationally acclaimed musicians – many of them Grammy nominated – featuring such luminaries as Eric Marienthal, Lois Conte, and Mike Miller. Besides working with Sharikov and Alborov and such a talented group of performers, producers and engineers, a true highlight of the project for Yuri was to finally be able to spend a few days in London mastering in the famous "Metropolis" studios and then be able to release both albums on CD and LP in 2015.